Kelva’s adhesive rollers have moisture resistant paper to ensure that the material remains stable during transit, storage and use. Consistent winding quality ensures equal contact with the rubber rollers. Kelva’s adhesive rollers have a very high adhesive coat weight and are available also pre-sheeted. Kelva’s polymer rollers are manufactured using low-silicone polymer compound, assuring a good pick-up of any contamination and preventing any silicone bleed to the material being cleaned. Kelva polymer rollers are also available in a FDA-approved, silicone-free version. All rollers can also be produced to fit non-Kelva cleaners. Please contact us to discuss your needs and find the ideal web cleaning solution. 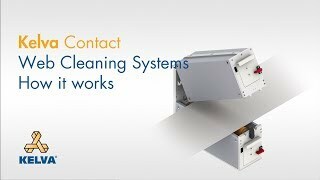 See the Kelva Contact Web Cleaner principle in action in the video below. · Web widths 250 mm to 650 mm!